Cecil Bradshaw – Joined Temple Lodge In 1927 – Temple Lodge, No.33, Duncan, B.C. The Corner House Cafe in downtown Duncan hosted a meeting of local history buffs on the evening Saturday, 5 November 2016. Temple Lodge, No.33 historian Mark Anderson attended the meeting along with about thirty other people who are interested in the history of Duncan and the Cowichan Valley. Several local collectors brought items from their collections to exhibit for the event. Among the items displayed was a realtors’ lawn sign for Cecil Bradshaw & Co. – Insurance & Real Estate. We believe this sign dates from the 1930s. 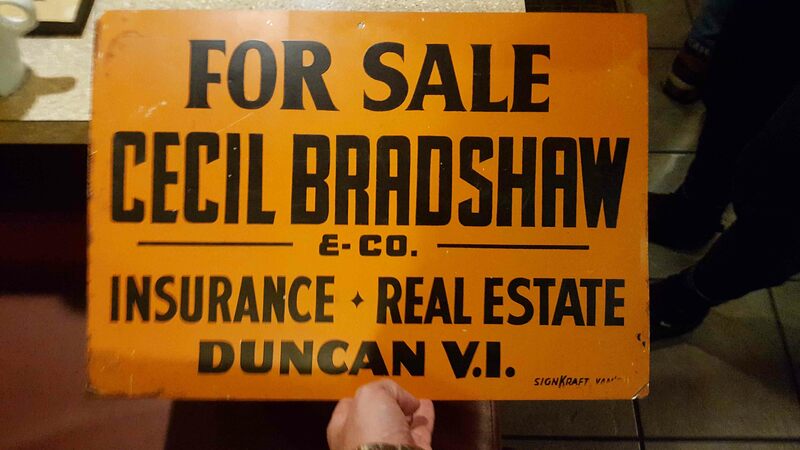 Sign for Cecil Bradshaw & Co. Insurance and Real Estate, circa 1930’s. The sign is part of a private collection. Used with permission. Cecil Bradshaw was a member of Temple Lodge, No.33. He was Initiated, Passed and Raised in 1927, one of over 20 new members who joined Temple Lodge in that year. We have not yet included a page for Cecil Bradshaw on our website but we will do some research this week and will put up a page on Cecil Bradshaw later this week. Thanks to the Corner House Cafe for hosting this event.